The communities of Hurst (population 805) and Bush (population 257) are literally next door neighbors, one might even say suburbs of each other, in far southern Illinois. It appears the only obstacle seprating the two towns is the road that leads you to them, Illinois Route 149. The towns are actually, though, 1/4 mile apart. They are located in the northwestern corner of Williamson County. The Big Muddy River flows to the south of the towns with branches that that flow to the east of Bush and the west of Hurst. The Missouri & Pacific Railroad curves through the two communities as well. Hurst was named after its land owner, farmer WC Hurst and was platted in 1903. Hurst was incorporated as a town in 1905. Bush was named after B.F. Bush and was originally set up as a mining camp. It was established in 1905 as well. Both of these towns are relatively late starters compared to most of the towns on this site. More information regarding Hurst and Bush can be found on the Illinois Trails webstite at: http://iltrails.org/williamson/mainblairsville.htm . A school was established in the Hurst-Bush area many years before the towns were even thought of. It was 1865, in fact, when a record of the first school in the area was established.The residents of the two towns probably agreed early on to consolidate their efforts of schooling for their children. A school house was bullt on Route 149 in 1922. The high school was established soon after the towns were incorporated, in the early 1900s. Hurst-Bush High School served the communities very proudly for approximately seven decades. It appears that financial stress and lowering enrollment became a cause for concern for the residents of the two towns. The year Hurst-Bush High School was closed for good was 1966. 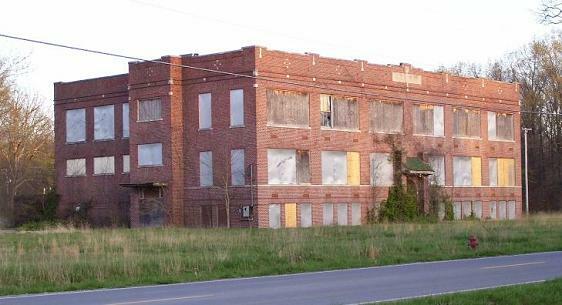 The high school-aged kids of the town now attend school at Herrin, their neighbor located about five miles to the southeast. Hurst-Bush continued to host its own grade school for about several years when, sadly, it too was closed in the late 1980s. The Hurst-Bush Grade School building is standing on the side of the road on Route 149. Its former cafeteria is being used as a bait shop and arcade. The Hurst-Bush High School building, pictured above, has met an all too familiar fate. After years of not being used, the building fell into a state of disrepair. The building was finally deemed unsafe and razed in May of 2008. See the newspaper article from "The Southern Illinoisian Newpaper" at the bottom of this page. "We have a forum going on about Hurst Bush Hummers and Bluestreaks. We currently have a few pictures that need dated, if possible, and to lend some closure to a picture. Please see the (photos above). One (at the top) is of the high school, date needed if possible. The second is a picture of the elementary school on the left and we are not 100% if it is the gymnasium on the right. I personally think it may be a rendition drawing of a picture for people to choose either or for the school. We had a gym there (it still stands), however, it looks totally different than the picture. I for one, attended the high school but when it was considered a middle school 1974-1978 (5th, 6th, 7 th and 8th). Your assistance would be greatly appreciated." School Fight Song: "We're Loyal To You Hurst-Bush High"
For we know you have sand, Hurst-Bush High! Victory from you Hurst-Bush High! The Hurst-Bush High School athletes had state-wide success in the boys sports of track, basketball, and cross country (www.lhsa.org). It is possible that baseball and football may also have been offered at one time. One Hurst-Bush thespian even won a medal at the IHSA speech competition. Information such as conference affiliation and school fight song are being sought. The boys basketball program at Hurst-Bush won a total of eight District titles spanning a time period of four decades. The "golden" era would appear to be the late 1940s and early 1950s. Between 1947 and 1951 the H-B boys won four of the five district titles they competed for. Unfortunately the team records and coach's names of these and other great Hurst-Bush High School teams are not available. **Coach Richard Ruggles would go on to coach the famous Cobden Appleknockers to a second place finish in the 1963-64 state tournament. Three male tracksters brought home a total of five medals for Hurst-Bush High School from the IHSA State Track Meet. The boys who competed actully just missed making the H-B teams finish in the top ten for their years. Hurst-Bush would have finished 11th in both in 1943 and 1957 if the IHSA recognized such a feat. The individual medalists are listed below. Note the two State Champions who both won their events in the old one-class system! "Hurst - Bush HS was the original host for many years in the 1940's and 1950's of the popular and well attended Mineral Area Track Meet...an invitational team track meet that featured area track teams from all over southern Illinois and as far north as the East St. Louis area. The meet was eventually transferred to SIU where it was held for many years." 1942-43 Ralph Corse 1 Mile Run STATE CHAMPION!! 1956-57 Tom Fann Pole Vault STATE CHAMPION!! The boys cross country team had one season in which its harriers competed with the "big boys" at the state cross country meet. The team of 1953-54 qualifed for the state meet, though they did not earn a top ten finish. Joe Spagnoli showed that the kids of Hurst-Bush were a multi-talented lot. Joe competed in the IHSA State Speech Competition in 1941. Joe's efforts were rewarded with a fourth place finish in the "serious" category. "Memories Are All That's Left"
HURST - All that's left of the school where Jackie Tweedy spent most of her career are a few bricks, four lights and two numbers off the old scoreboard, a sign from the girl's bathroom - and lots of memories. Whether it was the mischief she and her friends caused, hanging out at the local diner, the Powder Puff, at lunch or making friends, Tweedy had a strong bond with Hurst-Bush Community High School, which opened in 1922 and closed in 1966. So when it was finally torn down in May, she and other graduates had mixed feelings. Yvonne Holland, who graduated in 1954, said while it was hard to see it go, the building was so decrepit it was time to let it go. "It was kind of sad because so many of us went there," Yvonne said. "It's also a relief because it was caving in." Her husband, John Holland, also graduated in 1954 and was a custodian there for 33 years. He said the school was a fixture in the area. "It's sad that it's gone," John said. "It's something we won't see there anymore that we're used to seeing." Jackie said some of her fondest memories include the time spent with her friends. "It was just amazing," John said. "Just being able to sit with my friends and sit out on the lawn." John's best memories include playing sports as a member of the H.B. Hummers; Yvonne remembers the delicious food at the Powder Puff. She said the owner's chili recipe was divine. "The lady there had the best chili in the world," Yvonne said. But the former students also look back and laugh about some of the more mischievous times at the school, including memories of smoke billowing out from under a bridge where all the kids who smoked went to escape from the watchful eye of the faculty. Yvonne and Jackie also remember a few exploits of their own. "A friend and I set the clock forward, the bell went off, and everyone went home," Yvonne said. Tweedy remembers her cousin spitting out a window only to have the mass of saliva land on a teacher's head. "I'll never forget it," Jackie said. "We all got in trouble." John said he is proud of his roots at the school. He said many great students came from the school, including a few doctors and future faculty members. So even though the bricks have fallen, the legacy lives on in the students. "We all did good," Yvonne said. "We're not in jail and we don't do drugs. We all did good."